Artist's illustration of the Earth-size planet TRAPPIST-1d and its red-dwarf host star. New research suggests that potential signs of life in the atmospheres of planets like this could be tougher to detect than previously thought. Spotting signs of life in an alien planet's atmosphere may be tougher than scientists had thought. One prominent such "biosignature" target, ozone, may get trapped near the equators of Proxima b, TRAPPIST-1d and other potentially habitable worlds that orbit close to their host stars, making the gas hard to detect from afar, a new study suggests. Ozone is an unstable molecule that consists of three oxygen atoms. Here on Earth, the stuff is generally produced in the atmosphere after ultraviolet (UV) radiation from the sun splits "normal" diatomic oxygen (O2). The vast majority of Earth's O2 is generated by living organisms — plants and photosynthetic microbes — so ozone serves as a sort of secondary biomarker, at least for Earth-like life. Earth's atmospheric flows distribute most ozone relatively evenly into our planet's famous ozone layer, which helps shield life from harmful UV radiation. So hypothetical aliens studying Earth from afar with powerful telescopes would have a good chance of detecting the gas. Earth's atmosphere has a "transportation belt" of air flows that move ozone trappfrom the main production areas near the equator toward the poles. This mechanism is important for creating Earth's global ozone layer. Modeling work performed by the researchers indicates that, on planets with orbital periods of 25 Earth days or less, airflows tend to concentrate ozone (and other photochemically produced molecules) in an equatorial band. "We all knew from the beginning that the hunt for alien life will be a challenge," Carone said. "As it turns out, we are only just scratching the surface of how difficult it really will be." The new results also suggest that worlds like Proxima b don't have a global ozone layer. That may or may not have a significant negative effect on their habitability, Carone said. 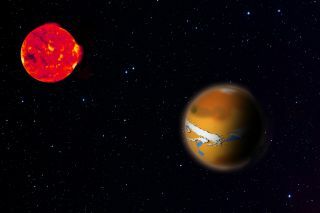 Tidally locked exoplanets could have air flows that trap ozone in the equatorial regions, presenting a previously unforeseen complication for the search for traces of life on these planets. "On the other hand, these stars can be very temperamental, and prone to violent outbursts of harmful radiation, including UV," she added. "There is still a lot that we don't know about these red dwarf stars. But I'm confident we will know much more in five years." In five years, astronomers will have a lot more data — from telescopes such as NASA's $8.8 billion James Webb Space Telescope, which is scheduled to launch in early 2019 — to inform their inferences about the habitability of red-dwarf planets. And advances in modeling techniques over this time span should help as well, study team members said. The new study will appear in the Feb. 1, 2018, issue of the journal Monthly Notices of the Royal Astronomical Society.